‘Tis the season, and all that. Isn’t it? Everyone’s favorite. The season of Christmas trees, candy canes, shiny bells and baubles. So, um, I’ll just say it. It’s rough to be a Jew in December. In truth, I’m not a very good Jew. I mean, I sort of switch hit, this time of year. No offense to Hannukah, but Christmas is just more fun. Sorry, Grandpa. I’m not trying to make any sort of religious statement here; all I’m saying is that I probably bake more Christmas cookies than anyone else with a menorah. I’m okay with it. Also, there’s this. Salty rosemary toffee crunch. 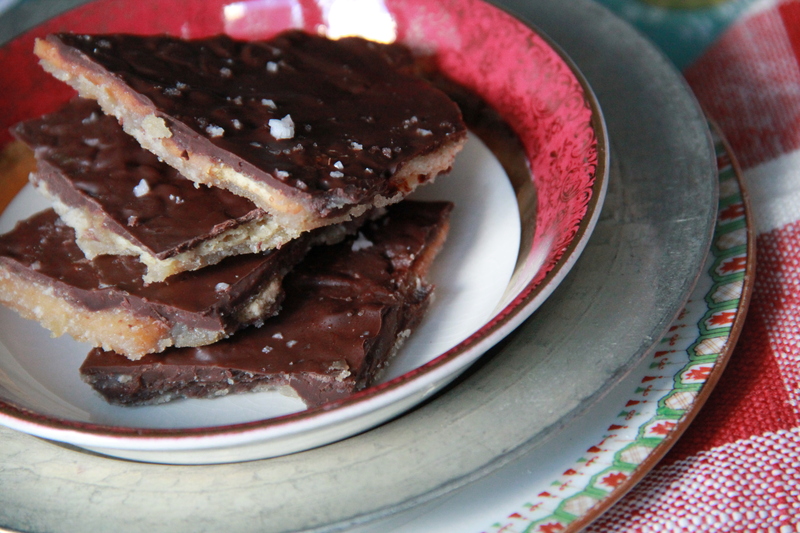 Salty and crunchy and thick with chocolate. 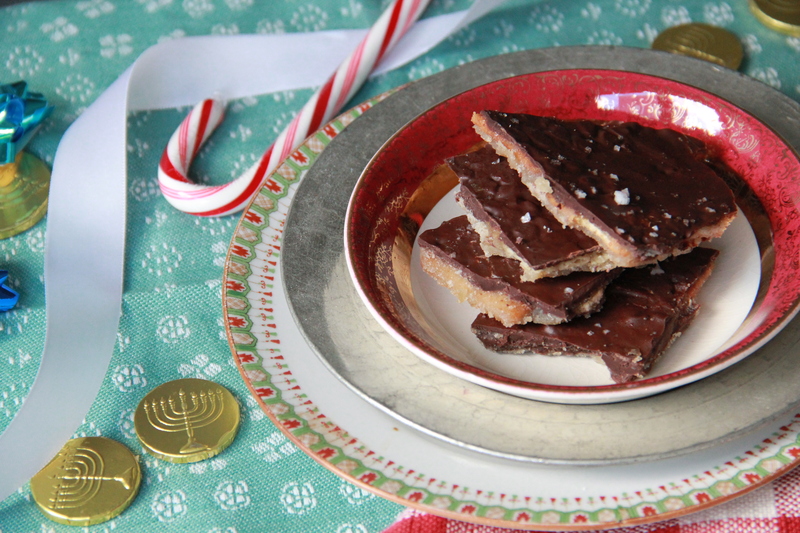 I usually make it for Passover, using matzoh instead of rosemary crackers, but hey, it’s December, and I went for something a bit more festive. You know, for the holidays. By which I mean Christmas. Sorry I’m not sorry. Preheat the oven to 375 degrees F, and line a large baking sheet (jelly roll pan) with tin foil for easy clean-up. Line the baking sheet with a single layer of rosemary crackers (don’t worry if they overlap a bit), and set aside. In a medium saucepan, melt the butter over medium heat. Whisk in the brown sugar and salt, until mostly dissolved and smooth. Pour the warm butter/sugar mixture on top of the crackers and place the baking sheet in the oven. Cook for exactly 7 minutes. Remove the pan from the oven, and sprinkle the chocolate chips on top of the crackers & bubbling sugar. Return the pan to the oven for 1 minute to help the chocolate melt. Remove the pan and use a small spatula to spread the melted chocolate over the crackers until evenly coated, and then sprinkle the sea salt on top. Place the pan in the refrigerator until it’s completely cool and the chocolate is firm. Break the toffee crunch up into small pieces and enjoy! The crunch is best stored in the refrigerator until ready to eat. Variations: Chopped cashews! Diced, dried apricots! Roasted pepitas! Sprinkle any of the these atop the melted chocolate layer to create your own crunchtastic variation. what kind of rosemary crackers? looks delish! Good question, Mag! I used a box of 365 brand rosemary crackers from Whole Foods… they come in a red box. I’m pretty sure any crackers will work as a substitute, though it’s best to use ones that are on the flaky side, with little holes on top (so the toffee can seep through). Did I mention I’ll have an issue calling you anything but that 🙂 I feel like it might as well be your official title. Thank you for self promoting your blog the other day, because I love it! Trying these with the family tonight. I’ll be trying to with gluten free crackers, I will let you know how that goes! Yay miss lisa! 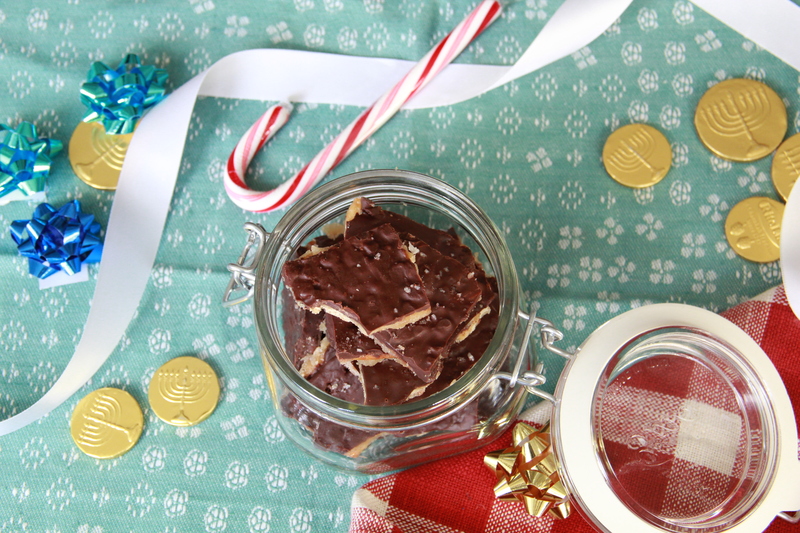 so glad you enjoy reading – can’t wait to hear how the gluten-free toffee crunch turns out! Heading to Whole Foods for the crackers and making this for this weekend’s holiday parties. Yay! Happy holidays to you!